There can be no higher tribute. The nation has fallen in love with the latest Great British Bake Off show. Sadly, the nerve-wracking baking and piping had to come to an end. 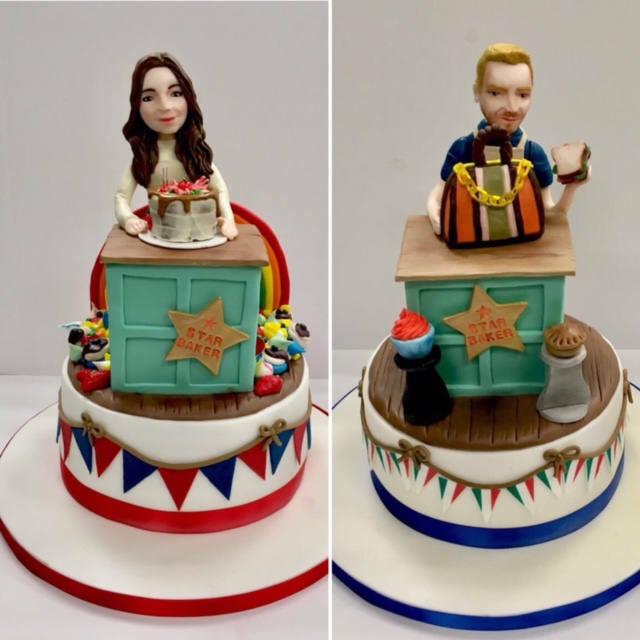 Never fear, we were over the moon to be able to immortalise the contestants in cake form. 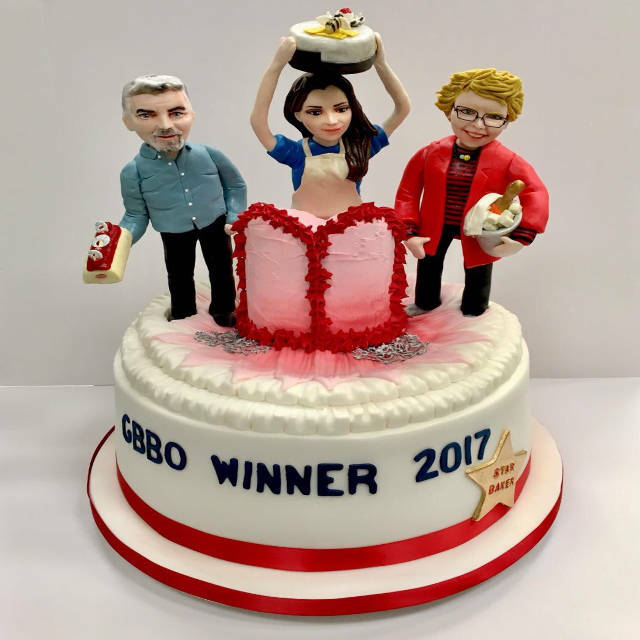 At Cakes by Robin we were delighted to once again bake cakes for Bake Off contestants marking their exit on the Extra Slice show, hosted by Jo Brand. The Extra Slice programme showed exclusive footage of all the best, worst and must-try-harder footage from The Great British Bake Off. Putting the baker’s best bits into cake designs, we think our cakes marked the very best of the contestants’ baking journeys. Our star baker and winner of this year’s Bake Off final, Sophie, was in the Army before discovering she had a flair for baking. 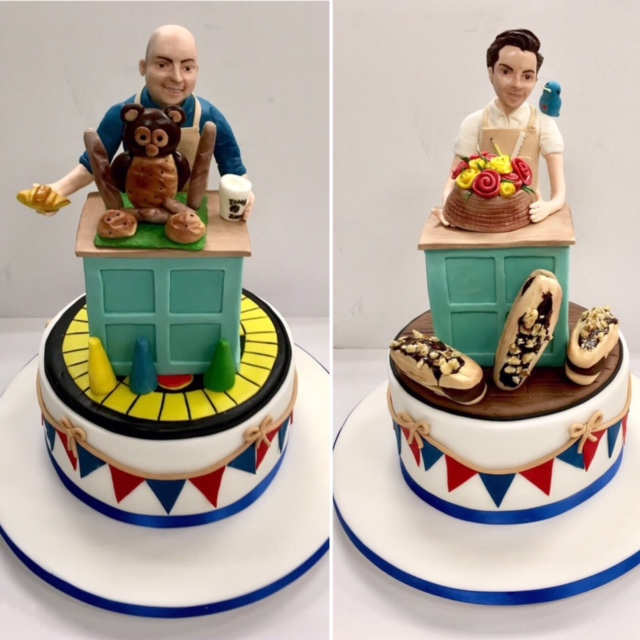 We just had to include her meringue tutu showstopper, the beautiful entremet, and Pru and Paul holding two of Sophie’s other successful bakes on the top of her Extra Slice cake. Well done Sophie. You were brilliant! Runner up, Liverpudlian Kate, a self-taught baker, made it to the final. Her mega highlights included a sticky toffee apple caramel cake and a beautiful rainbow meringue. We think we did those proud. Steven also made it to the final. Prior to The Bake Off, and since cooking and baking everything he eats, he managed to lose a whopping 5 stone. We adorned Steven’s Extra Slice cake with his brilliant bread handbag, sandwich illusion cake and awesome chess pieces. Brixton born Peter started admirably baking for health reasons (shop bought bread made him feel poorly). Someone had to go at week 1 and Peter didn’t quite make the grade. Nevertheless, we were very happy to engineer a cake presenting Peter and his coconut cake, along with a chocolate mini roll. Chris appeared on the extra slice after week 2. He’s obsessed with science baking! We loved Chris’s biscuit board game so were delighted to recreate that on a cake especially for him. We’re not sure how long we would last playing, before gobbling up the biscuits though! Flo left the show on bread week (week 3). She has always loved baking, but gave it up when her husband died. Her son encouraged her to start baking again to deal with the grief. Our special cake for Flo just had to have a fondant replica of her sitting on top of a watermelon cake. Wasn’t that cake fantastic! We sneaked one of her gin jam butties into the design too. Tom left the show on caramel week (week 4). Tom’s mother was a home economics teacher so taught him to bake from an early age, making recipes passed down from grandparents. We just had to show off his bread rose centrepiece and oops we couldn’t resist perching a replica hummingbird on our Tom fondant figure’s shoulder. Sorry Tom, we know it wasn’t your finest hour. Banker James was taught to bake by his father over 40 years ago. His time on the Bake Off was up at week 5. For his Extra Slice cake, we just had to include his owl bread sculpture, which we set on a mini replica of his board game showstopper. And it would have been simply rude not to include a fondant model of James holding his Mochachino! Julia, originally from Siberia, taught herself to cook from a young age. Pastry week (week 6) didn’t quite show Julia’s best work. We thought a fitting tribute to her time in the Bake Off tent should include her Russian doll cake, her bouncy biscuits and the famous snail! 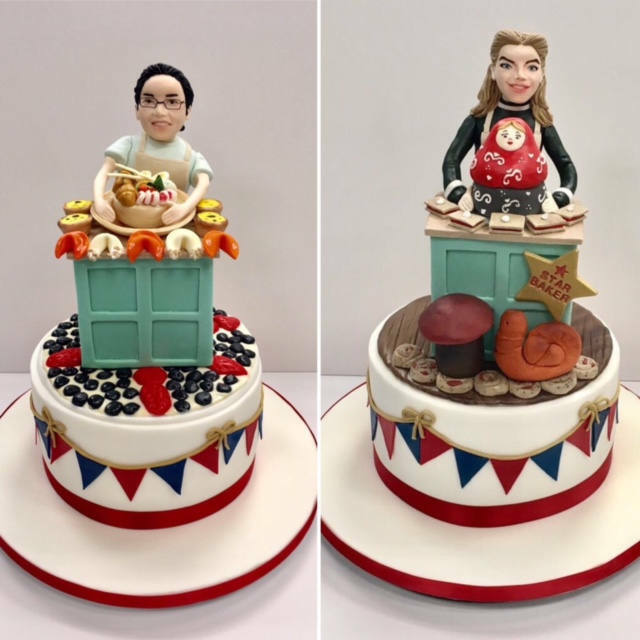 Hong Kong born Yan, a molecular biologist, started baking between shifts in the NHS. She left the Bake Off tent following Italian week (week 6). We made Yan’s thank you cake with special reference to her bananarama, fortune cookies and put her sitting proudly on her ‘heart of a hero’ terrine. The lovely Liam, known as ‘cake boy’ by his university friends, left the fold at week 8 (the week of forgotten bakes). Liam has plenty to be getting on with as his ambition is to teach his peers to bake! For Liam’s Extra Slice farewell cake, we replicated him sitting proudly on his pancake illusion cake, and paid homage to his Tetris shortbread and his nan’s Sunday dinner pie. Stacey, a self-confessed perfectionist, started baking when she was at university. She loves to incorporate her Jewish heritage into her baking, but didn’t quite hit it off at week 9, patisserie week. 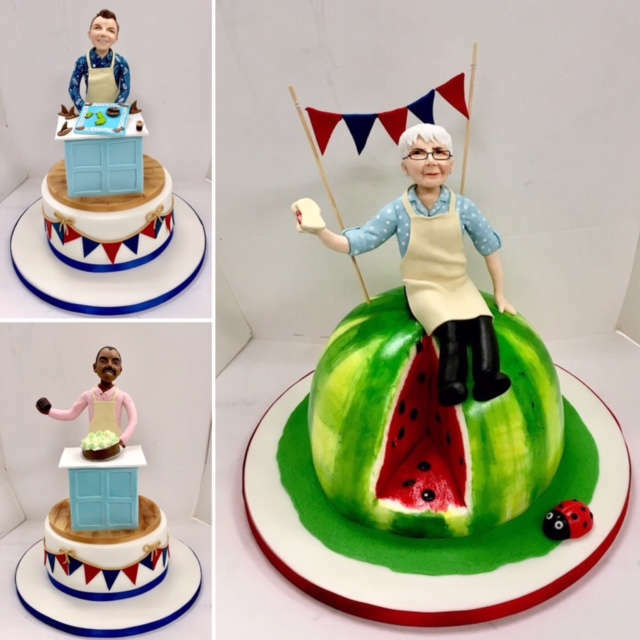 So close to reaching the final, we made the most of her best bakes, including her tropical filling trifle, and her brilliant Bakewell tart steamed pudding. We couldn’t resist showing Stacey holding a handshake winning clanger in each hand! 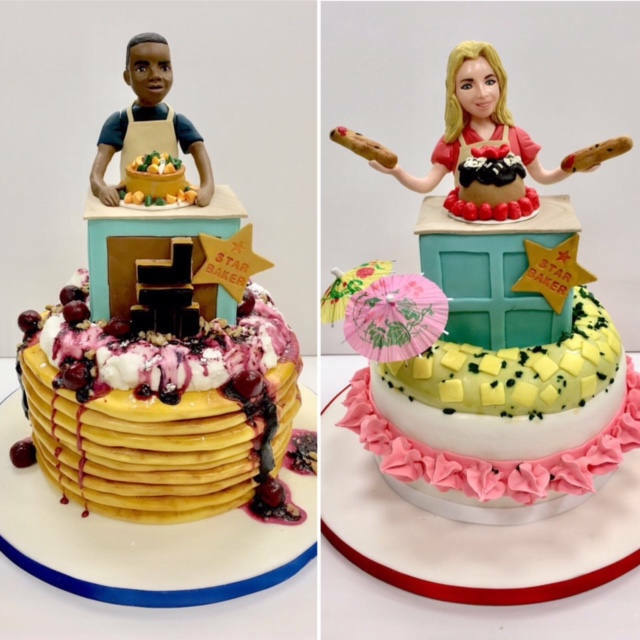 We had great fun creating the cakes for The Great British Bake Off: The Extra Slice. We consider ourselves extraordinarily lucky that we get to bake all day every day, but what are we going to do on a Tuesday night now!